If Singapore heads to a Technical Recession what happens to SGD INR?? Market has been rife about Singapore heading into a technical recession in 3rd Quarter of 2011. Prime Minister has revised the overall growth outlook downwards in the National Day speech and there has been a steady decline in the Electronics Export and other trading activities. A technical recession occurs when a economy experiences negative growth for 2 consecutive quarters. To spur the economic growth I would expect the fiscal authority to ease out the rise in Singapore dollar to make exports more competetive. Lets look at what happened in the last technical recession of 2008. The Singapore dollar depreciated 14% against the USD and moved from 1.35 to 1.54 in a span of 6 months!! 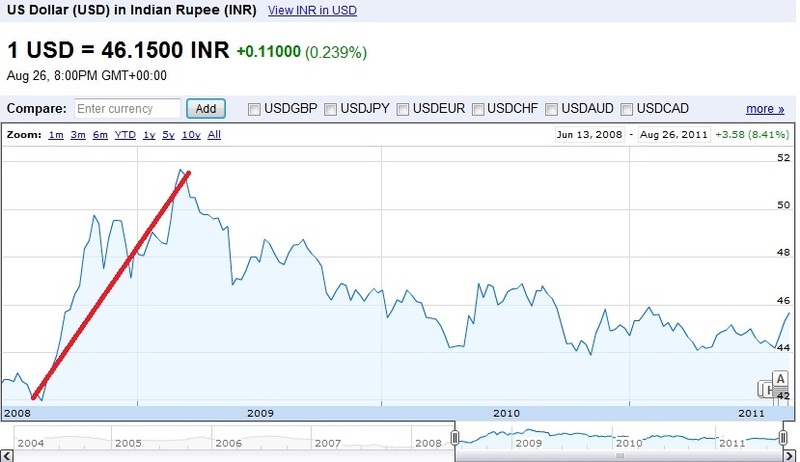 Now what does this mean for SGD-INR that is had a spectacular run of 9% annualised appreaciation in past 4 years? USD – INR moved to 51.5 from 42 in the same time frame which is a gain of 20%. Using the two gain numbers of 14% and 20% the USD-SGD pair should move to 1.37 from 1.20 as of today and USD-INR would touch 55.5. The cross rate usinf these calculations would come out to 40.51 for SGD – INR. I am sure all who have SGD holdings would get all excited seeing the figure, but before getting too excited lets look at other possibilities. The INR going beyond 50 mark will spell trouble for the Indian economy specially if the Oil prices remain around the $80 mark and the Reserve bank of India would intervene to stem the rise. So a possible future rate where the SGD weakens 14% the cross rate would come out to 36.50. Another possibility is that the SGD depreciates around 7-8% and moves to the 1.30 mark then SGD INR would be at the 38.46, assuming that INR moves to 50 against the USD which is also the current rate. Now lets throw in the Interest Rate of 10% for Term Deposits in India – for a 6 month period from the current rate of 38.4 any money invested in India would yield 40.32 in target rate (tax free) which is close to the rates in scenario 1. 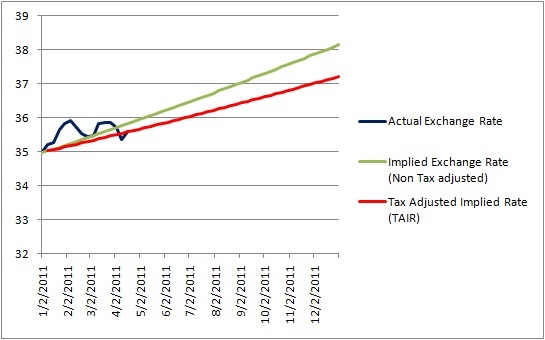 On a post tax basis the amount would grow to yield 39.74. So we have the facts lined up and no matter what the scenario is, repatriating money to India makes a lot of sense. SGD/INR – Has anything really changed?? Its been almost a year since I wrote anything on SGD INR or for that matter anything else. With the rate hovering around 35 there have been quite a few requests for me to express my views and here is my opinion. How has the Past Analysis fared? The first part of analysis held good but the rate moved opposite – towards the Rs. 35 mark. The instant question that comes to mind is Did I lose if I converted to INR instead of holding SGD’s? Whats the recommendation for upcoming months? I am going to stick with my recommendation that converting SGD to INR is beneficial in all situations and one would not loose by repartriating money to India and parking in fixed deposits. The Interest Rates have strenghthened to 9.5% as of today and conversion has become even more attractive. 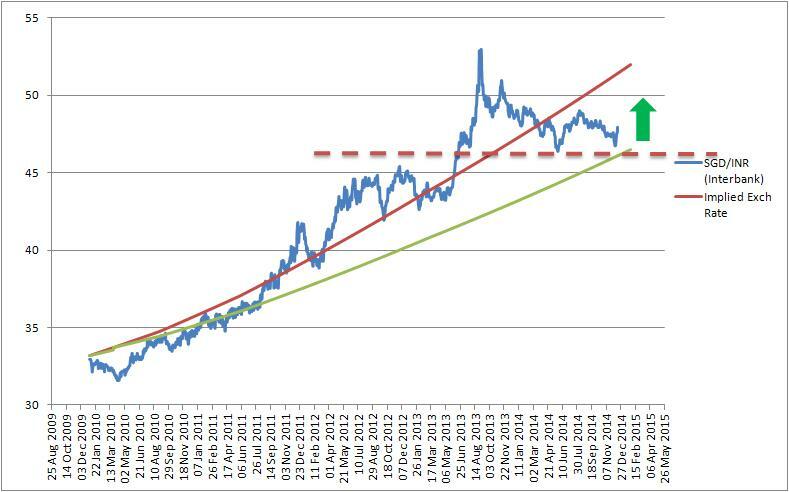 To substantiate – lets say we convert 1 SGD @ 35.85 now and invest @ 9.5%, it will grow to 39.25 in one years time. Would SGD INR touch 39.25 in one year? Unlikely!! SGD INR rate is a cross between USD-INR and USD-SGD for which the current rate is 44.25 and 1.235 respectively. For SGD INR to fetch 39.25 in a year the USD-SGD would have to move to 1.13, assuming that there is no change to USD INR. 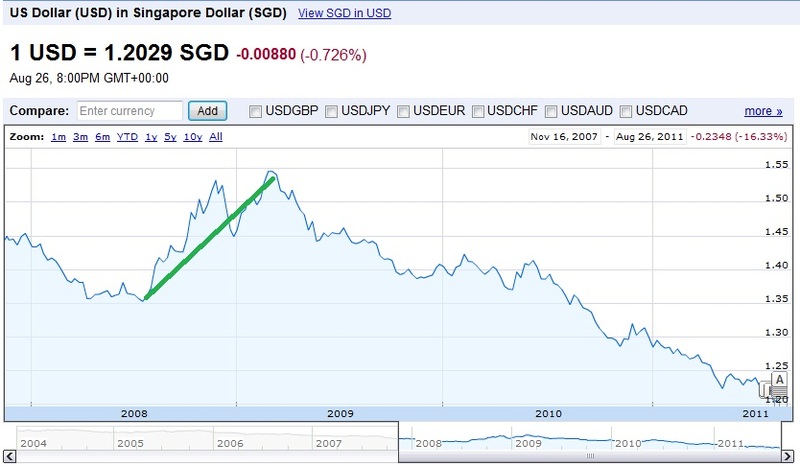 Consensus on the street is that USD-SGD could move up to 1.19 by October 2011. 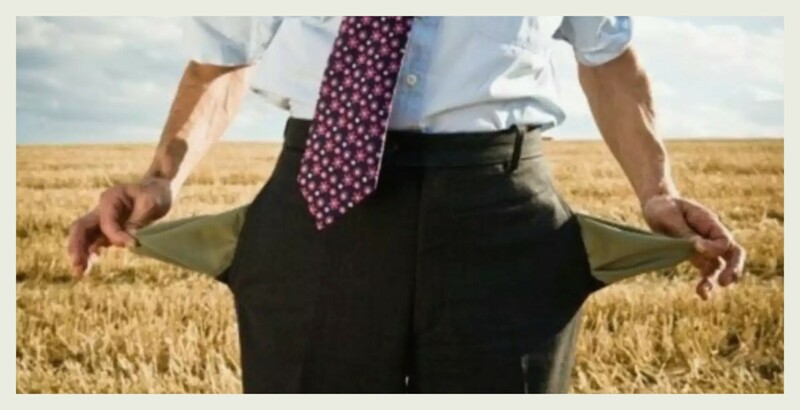 Even if INR weakens to 46 against the USD the possible rate would be 38.65 after a year which is lesser than what you get by investing in a Fixed Deposit. How do I decide when is a good time to convert? Exchange rates do not move linearly and with the volatility its difficult to know if its a good time to convert. 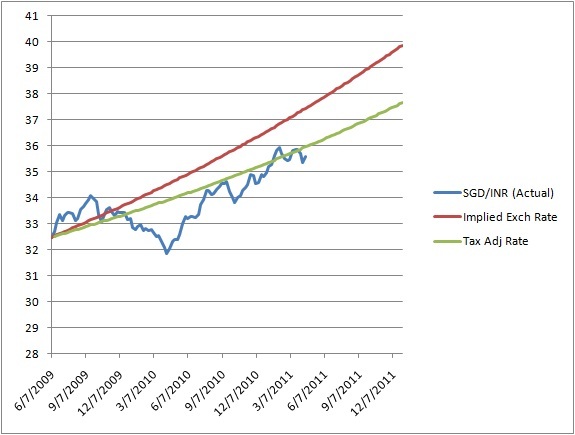 Also at the request of few readers I have added the dimension of taxability of interest income @ 30%. 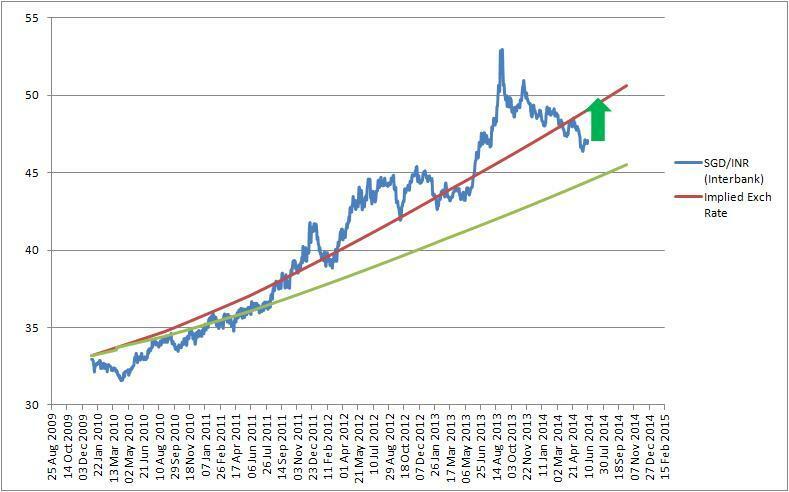 The below graph shows the movement of SGD INR for the past 2 years. Its beneficial to convert to INR whenever the actual rate moves away positively from the TAIR. On 13 Sep 2009 the TAIR was 32.94 and Actual Rate was 33.94, Actual Rate moved back to TAIR of 33.01 on 4 Oct 2009. On 30 Jan 2011 the Actual Rate was 35.81 against the TAIR of 35.49 and the two converged to 35.53 by 6 Feb 2011. The expectation is that with the Singapore elections on 7 May 2011 the SGD might appreciate quickly towards 1.19 against the USD giving a possible rate of 36.5 in next 2 weeks. If this happens you know what to do!! The Interbank Rate moved up to 36.55 today – target achieved. There is a slight possibility of the pair flirting with 37 levels but 36.5 is a good rate to convert.